Everything you need – and want – for your golf game or as a gift. 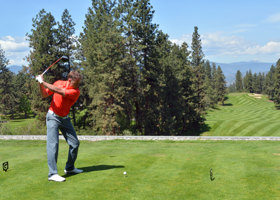 The Golf Shop at Gallagher's Canyon is one of Kelowna's best places to shop for a wide range of the latest men's and women's brand-name golf, sports and leisure wear, as well as accessories, footwear, souvenirs and rental equipment. The Golf Shop staff are here to assist you in finding everything you need for a pleasant and memorable day at Gallagher's Canyon. Whether golfing or just shopping, come take a look!